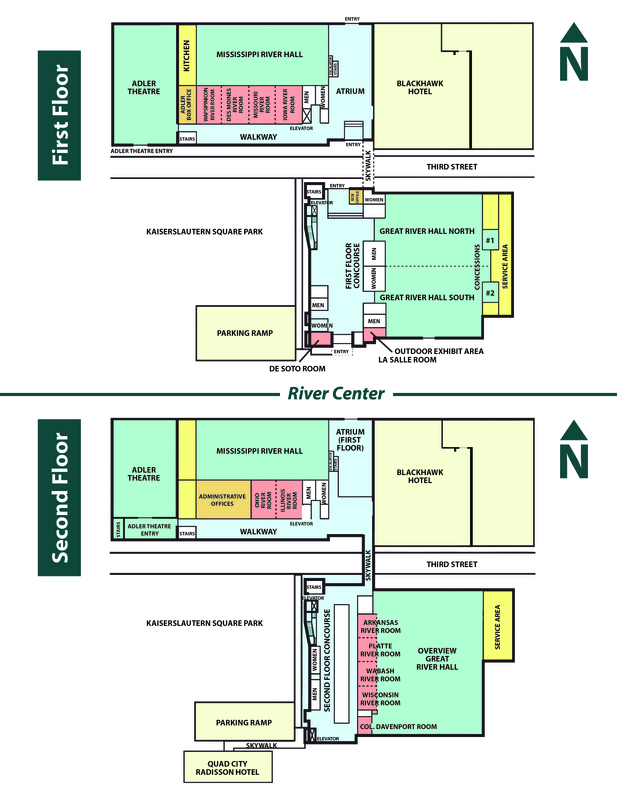 The RiverCenter is connected to the Adler Theatre, Radisson Quad City Plaza hotel, and Hotel Blackhawk. It is one of largest meeting/convention facilities in the Quad Cities and is conveniently located in downtown Davenport near attractions, restaurants, pubs, and nightlife. The RiverCenter is the perfect facility for meetings, conventions, trade shows, athletic events and all other special events and banquets. The facility offers 100,000 square feet of flexible space along with two column-free exhibit halls. In addition, the center features 10 expandable meetings rooms and an executive board room. Parking is available on-site and within close proximity. RiverCenter services include event coordination, catering, utilities, in-house audio-visual services, and decorating. This meeting space is also complimented with meeting facilities at both the Hotel Blackhawk and Radisson Quad City Plaza. Both hotels provide over 350 guest rooms. In addition, the adjacent Adler Theatre has seating for up to 2,400 people and is available for special presentations and lectures. The Adler Theatre also features a wonderful show schedule that can compliment your event. The Adler Theatre schedule includes nationally-recognized comedians, Broadway, the Quad City Symphony, and national concert tours. We look forward to hosting your next event and to working with you to make it a successful experience for all involved! WWE Presents NXT LiveLive at the RiverCenter WWE Presents NXT Live! NXT heads to Davenport for the FIRST time ever. Hogtoberfest presents Pigskin PigoutHogtoberfest is the Quad Cities' biggest celebration of pork, cheese and craft beer, all for a great cause! Square feet: 70000 sq. ft.
Largest room: 32400 sq. ft.